It’s been 5 years since Simply Framed came to be. We couldn’t have done it without the support of our customers, clients, vendors, family, friends, and the work of our phenomenal—and growing—team. It starts with a great product and continues with great customer service, and we owe so much of our growth to our awesome Operations team that makes the magic happen in our shops. Daisy, Becca, Allison, Karen, Beth, Stephen, and Olivia, you rock! Highlights from 2018 and beyond, featuring some of the friendly faces that have helped us grow. While we consider ourselves a forward-thinking bunch, to mark our 5-year anniversary, we thought it would be fun to look back at how we got here. At the advice of a big box framer, Dara frames concert posters in baby blue frames to match the design of her shabby-chic college dorm room. Lesson learned: Always frame concert posters one at a time in black or white. While employed at print company 20x200, Dara purchases a lot of art, only to schlep it around the streets of NYC in attempt to have it custom framed. Feels defeated by both process and cost. Dara gets to work on helping 20x200 add frame options to their website and pitches a very loose and early concept called "D's Frames" to her friend Mike Brown, Jr. He encourages Dara to keep her day job. Reflecting on her experience in 2010, Dara floats her idea for an online custom framing company to her creative collaborator, idea screener, and soon-to-be-husband, Zach. He thinks it’s awesome. They spend a lot of time validating the idea in Microsoft Excel. Dara and Zach present the business plan to a local commercial framing company in Miami. They want IN and give her production space and a small office. Dara starts driving around Miami with a small box of frame samples, offering frame consultations to anyone who ever said they "have a bunch of stuff lying around that needs to be framed." (Thank you, Michelle Varat, Ashley and Josh Liemer, and Jennie and Jared Melnik for being some of the earliest experimenters). Dara works with designer Scott Suiter (thank you, Bayley!) and design legend (and stone cold fox) Tom Suiter, Scott's father, to come up with the name, identity, and early web design. After brainstorming 632 names—a few baddies: Framed Good, Frameful, Likely Framed, Dream Corners—Suiter Co. and Dara finally land on Simply Framed. An early experiment framing a coffee bag; Winning the name game! Suiter Co. designs the Simply Framed logo, including our trademark frame corners and Scott creates a 6 page pdf explaining why we need to secure the “.com” and not rest on the “.co” . 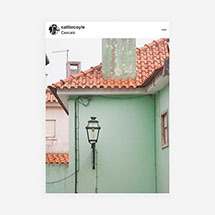 Scott notices an ad from Everlane about a crowdsourced pop up gallery called #WhereITravel. Dara gets in touch with Everlane’s CEO, and is introduced to—of all people—her former intern, Ling, securing Simply Framed as the print and framing partner for the event. SimplyFramed.com is still just a landing page with an email sign up. Scott, very happy to know his Valentine's Day gift will arrive in time for his now-wife, then girlfriend! (It was a framed Sriracha print, in case you were curious); Photography printed and custom framed by us at the Everlane #WhereITravel Pop-Up. On a whim, Dara finds out that Fab.com co-founder Bradford Shellhammer will be in Miami for Art Basel and invites him to coffee to discuss being an advisor. He says yes. Secure a highly-connected design-loving Advisor, check. The first official Simply Framed frame test order is placed for Dara’s friend, Gramlist Founder and predictor of all things cool, Brandon Perlman. The moment Brandon placed the very first order on SimplyFramed.com, from Panther Coffee in Sunset Harbour. SimplyFramed.com officially launches, becoming the first seamless end-to-end custom service for online custom framing. 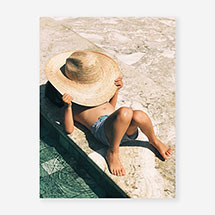 Dara notices photographer Gray Malin is selling prints unframed. She’s a fan. She offers to help him easily offer his photos framed to customers, with Simply Framed providing complete back-end services and drop shipping. A partnership is born, and Dara has an A-HA moment: If artists saw their framers as a partner and not just a vendor, both businesses could be better served. 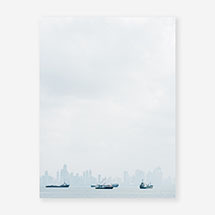 Art by Gray Malin in Simply Framed frames. We take a trip to SXSW poster show, teaming up with the inimitable graphic designer and artist Kii Arens. He let’s Dara crash his booth...and hooks her up with concert tickets to see Broken Bells. Dara presents Simply Framed at Apartment Therapy’s Maker Night, hosted by AT Media founder Maxwell Ryan. Maxwell instantly becomes a friend, mentor, and customer. Our first employee: Dara hires recent NYU grad Daisy, who comes with a fluffy cat named Pixel, to run daily operations. Employee #2, Garden & Gun alum, journalist MK Quinlan, joins the team to launch our Blog and grow our Pro partnerships. We publish the first installment of the In Frame series. We are featured in the The New York Times. Lauren Conrad asks us to build her a pretty pastel gallery wall and calls us "a super affordable mail-in framing solution that lets you shop for custom framing online.” - L.C. In the name of beautiful scarves everywhere, we launch textile framing. L.C. 's art collection included a combination of art prints by Rifle Paper Co., photos by Gray Malin, and a stunning Degas print that had been the family for years; Behind the scenes from our first scarf framing photoshoot. Joy Cho of Oh Joy! calls Dara right around Christmas asking to partner. Best Christmas gift ever! A dream gallery wall custom framed for Joy Cho, featuring vintage textiles and silk scarves, a print by Permanent Press Editions, another by Read Between the Lines, and a photo by Jen Gotch. We ship an amazing Gray Malin show to Paris and exhibit at the incredible fashion boutique Colette. First UNICEF Next Gen Art Party. With the help of Aaron Hartselle, and 4 hand-drawn Jason Polan “Giraffe” originals, Dara has a realization about redefining the UX of the site to let customers choose Frame Style and then Mat Style, thereby introducing the term “Mat Style” to the industry. Aaron saving the day and working his magic at the Unicef Art Party. Dara meets Cassie Ballard of The Veda House, and hires her to re-design, re-shoot, re-style, update packaging, and more. Ryan O'Neil also joins the team to bring more Pro partners on board and help with graphic design. Gallery Wall photographed by Cassie Ballard of Veda House. Miles Jacob Segal, heir to the Simply Framed dynasty, is born. Custom “Simply Segal” onesie by Dara’s bestie Christine Marzano. "We're gonna need a bigger boat!" We bid farewell to sunny Miami and move to a larger facility near Toledo, Ohio. Pixel does well with the move. Because our customers asked for it. Press framing launches on Simplyframed.com. More mat openings = more fun. Sara introduces Dara to Greta (that's me! ), Content Creator recently relocated from NYC to Boulder. Dara hires her to run the blog and social media, a role that would eventually morph and lead to the creation of Simply Flamed matches. Finally! We launch our Print & Frame service, helping transform digital photos into custom framed works of art with just a few clicks. 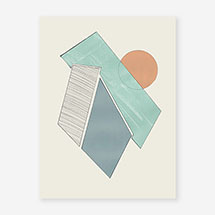 West Elm offers an exclusive collection of Simply Framed custom frame kits available on Westelm.com and via their in-store design services. Miles crashes our Press Framing photoshoot with Jared Wilson; Our Certificate Frame in Black Gold available as a Frame Kit on westelm.com. We partner with Uprise Art to exhibit custom framed artwork by Sayan Ray at NADA Miami Beach. Dara discovers Denver-based social media agency Saturday Social via an eye-catching photograph of a book styled with a pile of pink flamingos on the @bookofthemonth Instagram. A partnership is born. In collaboration with Maxwell Ryan, we introduce an all acrylic frame called Max Plexibox, becoming the first company to offer this custom product online, end-to-end, to customers and artists alike. The Instragram that lead us to Saturday Social; Maxwell Ryan sitting pretty with a gallery wall full of Max Plexiboxes. With a mission of giving the artists we work with more time to make art, we launch a Shopify App to our Pro partners. Metal frames, our thinnest and shiniest profiles yet, are added to our collection. Our homepage gets a sweet update, with each frame style finally having its own dedicated landing page—because we think they deserve it! Gallery White and Gallery Black are still our top sellers! We design and produce custom frames for over 1700 Polaroids by Ryan McGinley and a series of never-before-seen-photos of Basquiat, for two incredible shows at MCA Denver. A Wilder California Cacti Print in our Old School Metal Frame in Matte Rose Gold; All works by Ryan McGinley, courtesy the artist and Team Gallery, New York and Los Angeles. © Ryan McGinley. Installation image by Kelly Shroads Photography. Plexibox Frames in Neon Pink, Neon Orange, Neon Lime, along with Aqua and Blue arrive on Simplyframed.com. Maxwell Ryan covers the launch and artist Reed Weily opens a show at Station 16 in Denver using: Every. Single. Color. We hire Michael, our President and COO. Hi Michael! The Simply Framed Studio opens in the Cherry Creek neighborhood of Denver, CO, redefining the frame shop brick-and-mortar experience. Customers have unlimited access to all frame and mat styles. Employees have unlimited access to chocolate covered espresso beans 👍. The space, designed with Jodi Cook, features a stunning series of landscapes by Kate Holstein framed in Simply Framed Black Label. Photography by Our Love Is Loud. We frame the first batch of artworks for MCA Denver’s Octopus Initiative, a groundbreaking endeavor that allows patrons to borrow works from Denver-based artists to enjoy for ten months in their own homes. We expand services to 2 new facilities on the West Coast, supporting increased volumes and faster ship times on your West Coast orders. One sentence, thousands of hours of collective work. We hire (yet another employee who recently moved from NYC, this time to Aspen) Amanda to reach out to more artists to partner with. 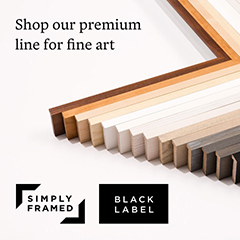 We soft launch Simply Framed Black Label, Fine Art Framing Made Simple, now available exclusively to our Pro partners. Thank you Rachel Rippy and Morgan Levy for your help with the catalog design and gorgeous photos. And to Jim & Julie Taylor for generously hosting the shoot. Our landlord rejects our proposal to paint the exterior wall next to us with a custom mural by Danielle Kroll. We. Are. Devastated. Despite the disappointment we feel about the mural, we are uplifted by the launch of Simply Toilet—Thanks Ryan O!—and the replacement of the silver mailbox with this one. The mural that could have been—sigh; Simply Toilet. Bayley, Scott, Thomas, Josh, Alan, Iris, Mariano, Christian, Maria, Robert, Mary, Gabi, Christina, Ryan Foster, Rob Curry, Bradford, Jessie & Perry, Margaret, Maxwell, Christy, Robert, Daisy, Morgan, Rachel, Kaitlin, MK, Ryan O’Neil, Cassie, Ayo, Amy, Allison, Jaime, Vincent, Andres, Nina, Niurka, Josephine, Rachel M, Hamish, Bob, Sara, Greta, Beth, Becca, Allison, Michael, Stephen, Karen, Olivia, Joe, Marisabel, Emma, Adam, Bryan, Amy, Kathryn & Perry, Cleo, Emma, Catalina. Gabe, Aaron & Carter, Christine, Ayo, Matt P, Patrick, & Tim. Alex, Ryan, Elena, Carly, Laura, Dana, Kevin, Chrisx2, Jennifer, Jeff, Arthur, Heather, Tom, Jacob, Janine, Gail, Steve, David, Kristi. Chaim, Barry, Nathan, Rowena, Ryan Morrissey, Bill, Blue, and Jodi Cook. Clif & Rosella, Laura, and Daniel Louis. Jaime, Ashley & Josh. Our very first customers in Miami— Brandon Perlman and Eli Randal. Our first "stranger" order: Jeff R. Chris S, Doug, Sara, Frank, Sean, Chris M, Nick, Michael, Juan. Liz, Kate, Gray, Ashlee, David, Jane, Inslee, Melissa, Drew, Jen Bekman, Corbin, Hillary & Laura, Mark, Mieke, Joy, Orlando, Emily, Brady, Tim, Cat, Joanna, Katya & Amri, Allison, AWB, Max, Margaux, Elan, Kelli, Tze, Whitney, Ian, Rachel, Rachel, Carly, Olivia, Sharon, Hopie, Lily, Yvette, Justina, Kristina, Evelyn, Kerri, Niki, Kathy, Carol, Sylvana, Louisiana, Alex, Clementine, Ling, Tamara Eaton, Samantha, Matt & Alex Orley, Grace & Chase. Alicia & Liana. Samantha & Maggie, Josh, Auri, Josephine, & Ravid. And the crazy part, there are thousands more. Finally on a personal note (from Dara), thank you to my family for providing endless support and hours hearing about the ins and outs of Simply Framed. Leanor, Andrew, Raquel, Gillian, Justin, Mom, Aba, Elie, Julia, David, Danielle, Daniel, Mila, Miles, & where this all began, Zach. Thank you. It's been 5 years, but it really feels like we're just getting started. We hope you enjoyed our little trip down memory lane. We have some really big news to share in a few weeks! Here's a hint: we're hiring for it now. Make sure to follow @simplyframed on Instagram and subscribe to our newsletter at the footer. We can’t wait to see what the next 5 years hold.